NOW OPEN: Proposition 1 Grant Solicitation now open! See the OPC Grant Guidelines and 2019 Grant Proposal Solicitation for more details on funding priorities. The deadline for applications is March 18, 2019. 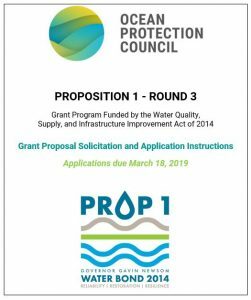 Visit the OPC Proposition 1 webpage for all details, including the Grant Solicitation, Grant Guidelines, Grant Guidance, and all forms and templates. Proposition 1 was approved by voters in November 2014. Funding from Prop 1 is intended to fund multi-benefit projects that provide more reliable water supplies, restore important species and habitat, and develop a more resilient and sustainably managed water system that can better withstand inevitable and unforeseen pressures in the coming decades.